There are many ways to keep a personal budget, but Left To Spend by Unknown Artists is one of the simplest methods around. The iPhone app is designed to be as basic as possible, while allowing you to quickly keep track of your daily spending. Bottom Line: Left to Spend isn’t terribly eye-catching, but it will show you how much money you’ve got left in your budget on a given day. Left To Spend asks you to do a little work before you start using the app. When you launch the app for the first time, you’ll be asked to calculate how much money you have left over after all of your monthly bills have been paid (and presumably any amount you’ve allotted for savings). The app then instructs you to divide that number by 31 for the days of the month. (The user can probably figure out to adjust that figure to 28, 29, or 30 for the shorter months of the year.) The resulting number is your daily budget. Say, for example, that you enter $20 as your daily allowance. Each morning, that figure will appear in Left to Spend. As you spend money through the day, you enter the amount in the app, which deducts that amount from your remaining balance. Buy a cup of coffee for $2, for example, and after you enter that amount and tap, your balance adjusts to $18. 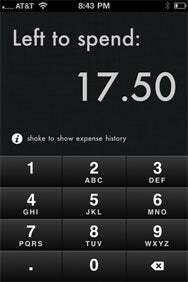 Shaking the iPhone pulls up an expense log for quick reviews of the amounts you’ve spent. The app doesn’t give you the option of where you spent your money, so tracking expenses in that manner isn’t possible with Left To Spend. The simplicity of Left To Spend may be taken a bit too far in certain areas. There is no easy way to immediately update the daily amount, for example—I had to delete and reinstall the app. And it feels like there is room for a few more features while maintaining the minimalist aesthetic. Still, if this type of personal budgeting appeals to you, Left To Spend offers an easy visual glance at your personal expenses. And at $1, the app won’t take up too much of your daily budget.